ROME (CNS) — Just as divisions in society grow when wealth is not shared, divisions within Christianity grow when the richness of gifts God has given to one Christian church or community are not recognized and shared, Pope Francis said. “It is easy to forget the fundamental equality existing among us: that once we were all slaves to sin, that the Lord saved us in baptism and called us his children,” the pope said Jan. 18 during an ecumenical evening prayer service at Rome’s Basilica of St. Paul Outside the Walls. At the beginning of the service, Pope Francis, Orthodox Metropolitan Gennadios of Italy and Malta and the Rev. Tim Macquiban, minister of Rome’s Ponte Sant’Angelo Methodist Church, paused for a moment of prayer before the presumed tomb of St. Paul. The prayer service marked the beginning of the Week of Prayer for Christian Unity. The theme for 2019 — “Justice, Only Justice, Shall You Pursue” — was chosen by a group of Christians in Indonesia. 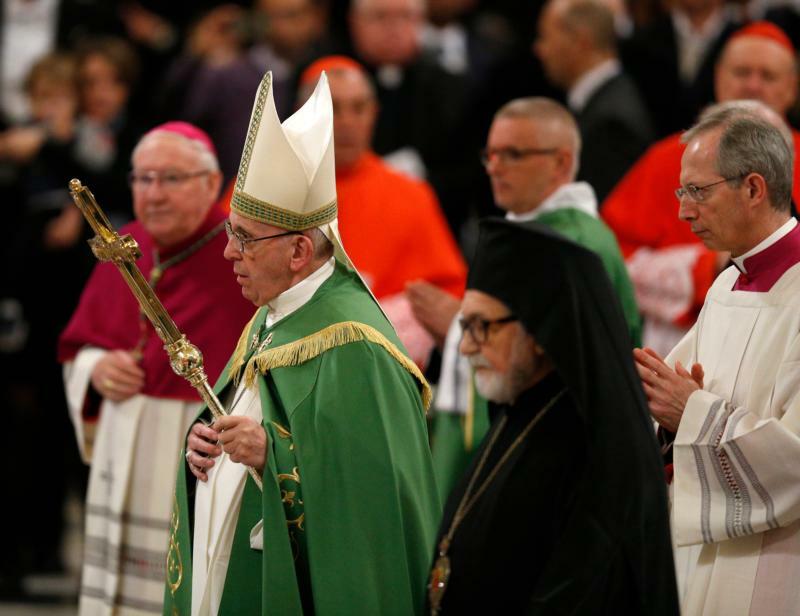 “We have forgotten the wisdom of the Mosaic law: If wealth is not shared, society is divided,” the pope said. In an analogous way, he said, Christians also tend to forget that they are brothers and sisters, equally saved through baptism. “It is easy to think that the spiritual grace granted us is our property, something to which we are due, our property,” the pope said. Or one group of Christians can be so focused on the gifts they have received from God that they are blind to the gifts God has given others. The path to Christian unity, the oneness that Jesus prayed his disciples would have, begins with humbly recognizing that “the blessings we have received are not ours by right, but have come to us as a gift; they were given to be shared with others,” he said.